Starting off the festival season is Gateshead's annual weekend festival at the Sage. This festival is run by Ros Rigby and her team and is produced by Serious so expect big name acts from the UK and abroad. The line-up for 2016 has already been announced and will feature performances from Gregory Porter, Evan Parker and a special large scale performance by Phil Meadows' Engines Orchestra and the Northern Sinfonia, amongst many others. Everything takes place under one roof too, which is pretty handy. Running over a long weekend, this festival presents performances across Darlington. There's a strong focus on Northern artists and last year they had acts like Durham Alumni Big Band, Al Wood, Matt Roberts and Jamil Sheriff. There's a great tradition of jazz education and big band playing in this area and it's reflected in the festival programming. 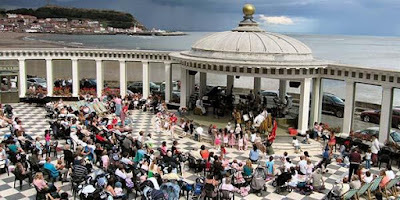 A 5 Day Jazz Festival with over 40 bands, 350 musicians, a blues stage, a soul stage, lots of free music in pubs, a picnic in the park and a Saturday Street Party - what better way to spend your bank holiday monday. Geoff Jackson and his team run this festival annually and are always looking for volunteers (see the website) to help out. 2016's programme includes headliners like Ben Crosland, Ray Gelato and Courtney Pine. Set in the picturesque Lake District, this festival is a celebration of traditional, New Orleans and Mainstream jazz. The programme showcases a wealth of UK talent and as well as many live performances, there are also talks and dance classes. Expect artists like Roy Williams, Enrico Tomasso, Keith Nichols and The Basin Street Brawlers.